are discussed in an interview for Satellite Executive Briefing. 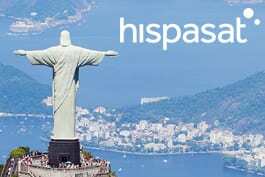 Hispasat and Gilat have joined together to offer a new high-quality satellite-based broadband connectivity service in Brazil. In 2018, Gilat helped the world move closer towards closing the digital divide by providing solutions that enable abundant broadband connectivity to unserved and underserved areas on land, sea and air. Read more on Gilat’s 2018 year review for SatNews. Gilat provides fully managed satellite backhaul implementation for Globe Telecom.